This week, we’re releasing the second part of Randy Olson’s insight on data visualization. In the first part, Randy defines data visualization and the process of creating a quality data visualization. Here, we’ll continue to develop upon that. Randy is the community leader for the wildly popular /r/DataIsBeautiful and a frequent contributor with some of the top content. He is an AI researcher at the University of Pennsylvania, ushering us into the next era of Artificial Intelligence without the side effects from Skynet. He tweets daily about data analysis and visualization at @randal_olson. Visit his popular personal blog to follow his expertise as a data visualization practitioner. How else would you define and measure the quality of a chart? If the chart passes those two major tests of conveying a clear story and usage of the proper chart, I'll start looking for other telltale signs of a good visualization. Visualization design research has shown that including some sort of picture related to the data can help with long-term recall of the information in the chart. However, many charts -- especially in infographics -- go overboard and include far too much chartjunk, which ends up diluting rather than clarifying the story the chart was meant to convey. The web site "WTF Visualizations" provides some excellent examples of charts with excessive and pointless chartjunk. Visually misrepresenting, but we have blue Pacman! I also look to see whether the visualization story is put in the right context, i.e., if the visualization tells the whole story. Too often charts provide a limited view of the data -- too short of a time period, for example -- for a meaningful conclusion to be drawn. Lastly, I look for whether the visualization can be fact-checked. Are the data sources properly listed? Is the data it used readily available, or is it hidden away on someone's hard drive? Are the details of the analysis provided if the data was manipulated in any way? Most of the time, if I can't reproduce the analysis underlying a visualization, I don't put much weight on the resulting conclusions. What are some examples of a good data visualization? 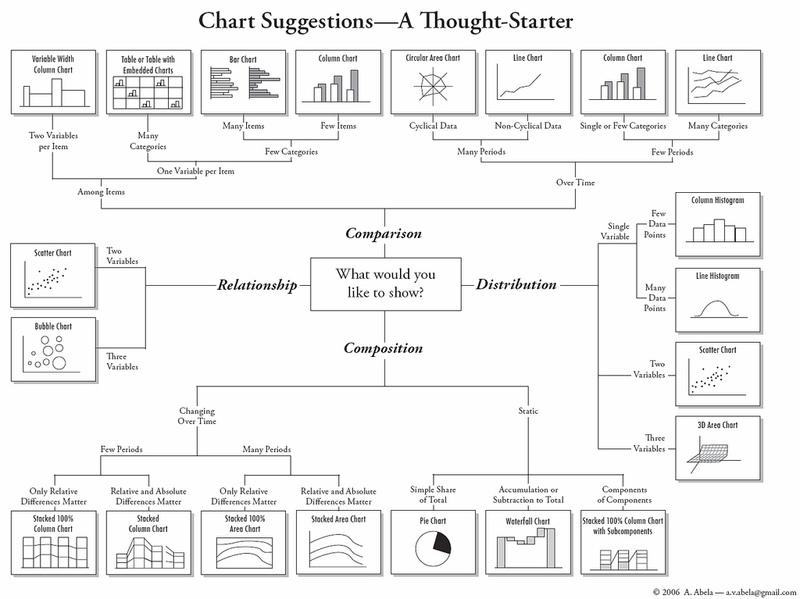 One of my favorite charts to point people to is called "Chart suggestions -- a thought-starter" because it puts the designer in the right mindset from the beginning: "What story would you like to tell? What chart type tells that story the best?" "Breathing City" is one of my favorite examples of an excellently designed visualization in Excel. Have you seen tangible ROI/results from data visualization? Do you have any examples? Arguably, the success of my blog has been due to data visualization. Every article I write is accompanied by a data visualization, or several, that communicates the story I want to tell. My readers don't even need to read the text to understand the main points. In the modern-day attention economy, it's hard to get someone to pay attention for more than a few minutes, so it's vital that your message be communicated clearly and succinctly. What future developments and trends do you predict in the field of data visualization? I foresee "big data" visualization to be an important, upcoming topic. As we hit the limits of what analytical techniques can teach us about massive data sets, there will be a need to visualize large-scale data so humans can analyze and spot patterns in the data themselves. Be sure to take a look at Randy’s website and /r/DataIsBeautiful. Subscribe to our email newsletter to receive insight on visual intelligence!